PAW Coat, Skin & Nails™ Multivitamin Chews are highly palatable low fat kangaroo based chews to help support a healthy skin, a shiny coat and strong nails in your dog. PAW Coat, Skin & Nails™ Multivitamin Chews are highly palatable low fat kangaroo based chews to help support a healthy skin, a shiny coat and strong nails in your dog. 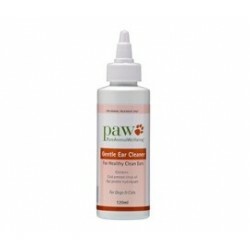 It contains essential nutrients such as Biotin, Silica and Chia seeds to maintain a healthy skin and coat. PAW Coat, Skin & Nails chews are available in a 300 g tub. Each tub contains approx. 60 chews. 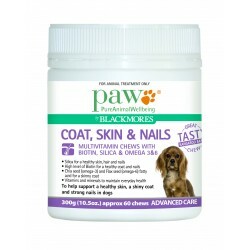 my dog was on paws normal multivitamin, then in march I switched to this , she got really sensative skin and after taking this one, you can feel the difference, less scratching and less hot spot happened on her. good product and i will be sticky to this one in the future.